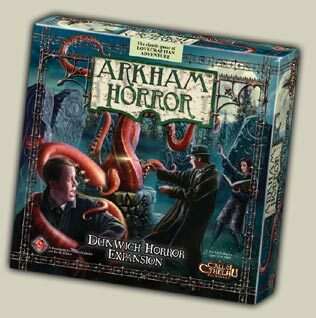 The Dunwich Horror expansion takes the game to a rural village setting that borrows from the Lovecraft tale of the same name. This is a great expansion that adds a number of tweaked effects, my favorite of which being the injury and madness cards (permanent detriments to avoid a character's death). Between the extra board, extra monsters, extra cards, and the Dunwich Horror himself, a lot is added to the base game. Highly recommended. If you like Arkham at all....buy this! A new board, new goodies, new location cards that will double the base game's encounters, plus the best part with the injury and madness decks. One of the best expansions for a great game. Great expansion to a great game. My fav of the ones I've played.